Some of us can use a little help in putting on socks. Perhaps arthritis, avoirdupois in the stomach area, or a temperamental back makes it desirable to use "Sock-Aid". 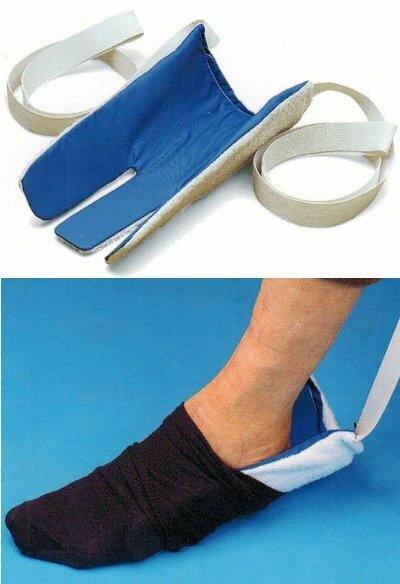 This is an outlandish piece of plastic with cloth draw-strings that, believe it or not, lets you put on your socks without bending over. You curl up the installer until it is roughly the shape of a foot, but is larger than a foot. Then you put a sock (preferably a large, non-binding type like we sell, but it will work with other large socks) over the installer. You then grasp the two webbings in both hands and throw the installer on the floor in front of you. You work your foot into the inside of the installer, and once it is pretty much all inside, you pull on the webbings with both hands, removing the installer, leaving the sock on your foot. Some adjustment (pulling) of the sock with one hand, or a reacher, is usually required, but the worst part is over, once you pull the sock installer away. It sounds unlikely, but it really works, and we get very few returned to us.